Two female fans of Ed Sheeran, who attended a meet and greet event with the singer, died after their car collided with a truck on a motorway. 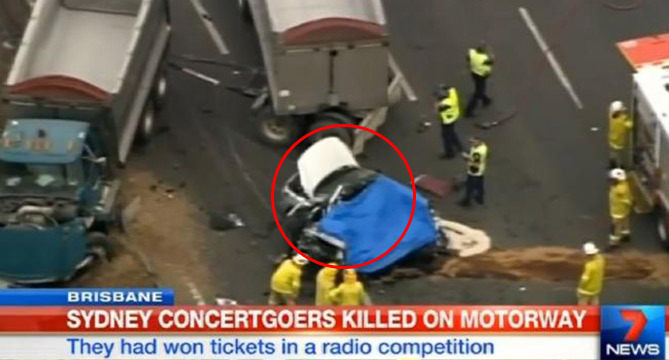 Channel 7 News reports on November 30 that the victims from Sydney were killed in the crash that occured in Queensland at around 10:20 a.m. on the Logan Road off ramp. Another woman who survived the mishap suffered serious injuries and was rushed to the Princess Alexandra Hospital for treatment. It is believed that they went to Brisbane to participate in a radio competition to meet Sheeran in person, in connection with the British artist's concert on Saturday night at Suncorp Stadium. There were indications that the car's tyre blew up, according to the report. The truck crashed into a concrete barrier but its driver came out unscathed.